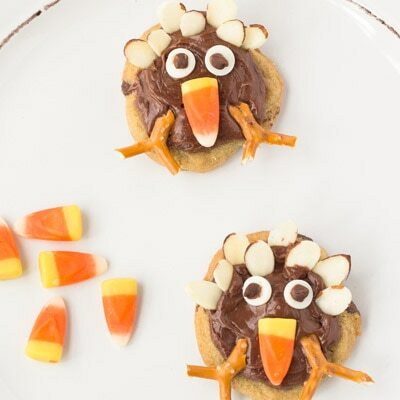 You and your guests will want to gobble up these Thanksgiving Turkey Cookies. Using our refrigerated chocolate chip cookie dough as the base of these adorable cookies, frosting and almond slices are used to decorate the "turkey's" body. For the finishing touches, white and semi-sweet mini morsels are used for the eyes, candy corn as the nose and pretzel pieces are used as the feet for this tasty treat! Who says you can't have turkey for dinner and dessert! FROST cookies with chocolate frosting. Insert 8 to 10 almond slices into frosting for feathers on each cookie. Place two white morsels upside down on each as eyes. Adhere mini morsel pupils to white morsels with frosting. Place candy corns as nose and two pretzel pieces for feet on each. NOTE: Candy corns can be used for feathers instead of almond slices.